Do You Remember What You Were Worried About Last Year? Just recently, I noticed a note at the bottom of our calendar that read: “Kid’s time capsules in my beside table”. I had completely forgotten that we’d done time capsules with the kids last New Year’s Eve, which makes discovering them now even more exciting. I have no recollection what is written inside the time capsules, but I know we used them as a faith building activity. It’s been a technique my husband and I have used ourselves for years to build faith for the future and relive God’s provision over the past. One summer when I was in university, I didn’t have a job. I had submitted a number of applications for work, and had enlisted at a number of temporary agencies, but nothing had come through yet. I decided to wake up early each morning, and pray for God to provide work for me that day. My husband and I have employed the same technique since. We wrote to our future selves when we had our house on the market, when our parents’ health was faltering, when we had concerns about finances or children or family or friends. These notes turned into a cherished New Year’s tradition. It is always fascinating how the problems of a year ago are often resolved, and also often forgotten, a year later. Writing about them in advance, and reading about them a year later is a way to remember God’s presence and faithfulness in our lives. It reveals His testimony to us. After reading the letters, we always end with thanking God for what He has done in our lives over the past year. We have also kept past letters to re-read for years to come. 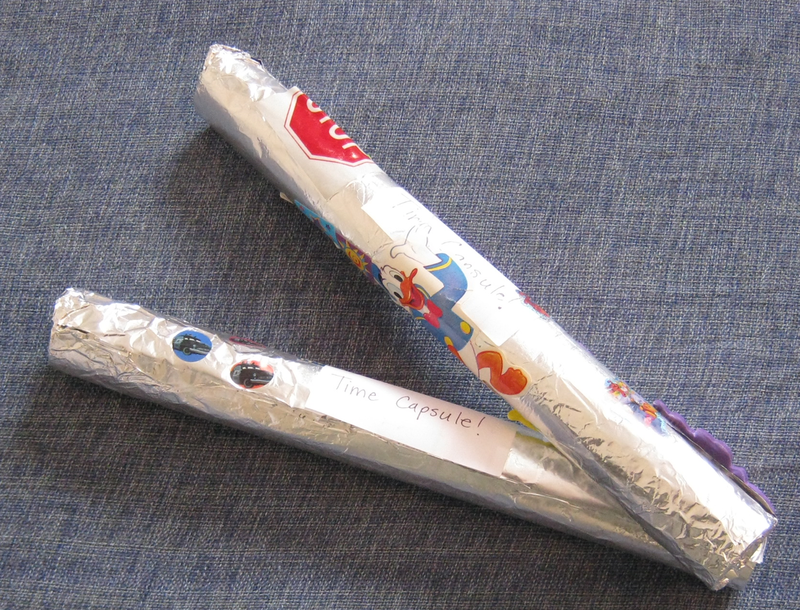 I was tempted to open one of the kid’s time capsules and peek inside while writing this post. But, I decided not to. I can guess that we asked them similar questions to those we ask ourselves. And, I like a surprise. Why not make this a New Year’s tradition in your family this year? What are you facing in 2014? How do you want to grow? What is going well? What are you concerned about? What are you waiting on? What are you dreading? Write them down, pray about them, and relive the memories and God’s faithfulness next year. P.S. – Don’t forget to write a note on your calendar so that you remember where you hid the letters!